The TTABlog®: New from the TTABlog Songbook: "STEALTH"
New from the TTABlog Songbook: "STEALTH"
STEALTH! When I hear you I think of a wedge-winged aircraft. Or maybe some grizzly guy skulking about in the dark. that you were a mark. 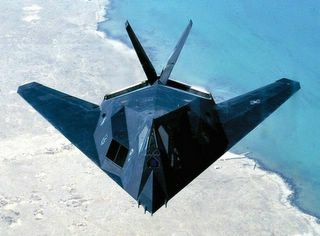 STEALTH! I had never encountered this Leo Stoller. He claims he's the owner of every word within sight. Rent-a-mark, no thanks I'’ve got my own. STEALTH! You can fool a few people with b.s. and bluster. But most of us know that it's best just to pay you no mind. What's next for the songbook? I'm open to suggestions.